Tom Krieglstein: Are NYC MetroCard Unlimited Passes Worth It? Are NYC MetroCard Unlimited Passes Worth It? Three happy years without a car has forced Annie and I to navigate via public transportation. In Chicago, we had the CTA system down, but as NYC newbies, we're slowly learning a new system with a different fee structure. In debating on getting an unlimited pass or not, here's a quick guide to determine if it's worth the money. A single ride on a normal NYC train or bus is $2.25 per ride, but if you pre-buy $8 or more you get 15% discount on rides, making the net cost per ride $1.91. So the question is, is it better to pay per ride at $1.91, or get one of the unlimited passes? 1-Day Fun Pass Cost: $8.25. Good for unlimited subway and local bus rides from first use until 3 a.m. the following day. This pass will save you money if you plan to ride 5 or more times within the given time. 7-Day Unlimited Ride MetroCard Cost: $27. Good for unlimited subway and local bus rides until midnight, 7 days from day of first use. This pass will save you money if you plan to ride 15 or more times within the given time. 14-Day Unlimited Ride MetroCard Cost: $51.50. Good for unlimited subway and local bus rides until midnight, 14 days from day of first use. This pass will save you money if you plan to ride 28 or more times within the given time. 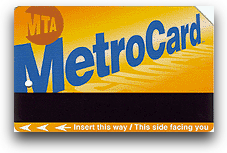 30-Day Unlimited Ride MetroCard Cost: $89. Good for unlimited subway and local bus rides until midnight, 30 days from day of first use. This pass will save you money if you plan to ride 48 or more times within the given time.